﻿ Coppess Nature Sanctuary - Ohio. Find It Here. Coppess Nature Sanctuary is a 32-acre woodland donated by Mrs. Frances Carpenter and was the catalyst for the creation of the Darke County Park District in 1972. 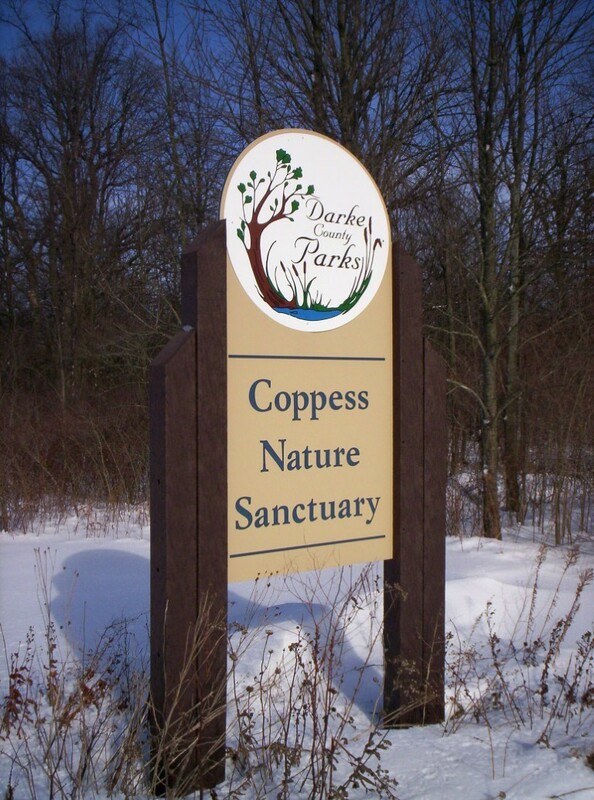 Her wish to preserve a portion of Darke County as it might have appeared in pre-settlement time is a lasting tribute to her family and a legacy to all Darke County residents.Coppess Nature Sanctuary is located in west central Darke County on Young Road (County Road 85). A level, well maintained ¾ mile loop trail, beginning and ending at a convenient parking area, make this an ideal place for a short hike satisfying a wide variety of interests and abilities.Coppess Nature Sanctuary offers a splendid example of an Oak-Hickory forest and a glimpse of some of the great natural diversity of the Darke County region as it appeared 200 years ago. Five species of large Oaks dominate the area. Several White Oaks have a diameter of 40 inches or more. Shagbark and Bitternut Hickories are scattered throughout the area. Other trees of interest include American Beech, American Hornbeam, White Ash, Box Elder and Sugar Maple. More than 38 species of woody plants have been identified.The forest floor plant community is also impressive with more than 84 species of plants including spring wildflowers such as Dutchmans Breeches, Trilliums, Bloodroot, Mayapple, and Yellow Trout Lily.